An 18 year-old attempted to stab police officers as Shabbat was ending. The officers responded quickly and overpowered the teen terrorist. An 18 year old Arab teenager attacked police officers outside the Damascus gate in Jerusalem just as Shabbat was coming to a close. From initial reports the teen aroused police suspicion and they began to approached him. The teen seeing the police coming toward him took out a knife and attempted to stab them. The officers quickly overpowered the terrorist and arrested him. No injuries were incurred during the incident. On Friday afternoon, just before Shabbat, an Arab terrorist attempted to ram his car into a group of soldiers near the Arab village of Silwad, which is located near the Jewish town of Ofra. According to reports the terrorist was killed in the attempt. On Friday morning two Border Police officers were lightly to moderately wounded in a stabbing attack that also took place at the Damascus gate. The officers suffered stab wounds to the upper body, and the terrorist was eliminated. A 50-year-old female Arab passerby was lightly wounded in the leg by shrapnel as the terrorist was shot. 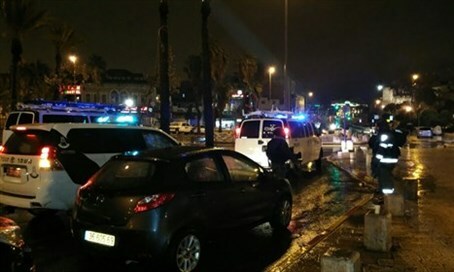 "A terrorist attacked a squad of officers from behind, stabbed and wounded them lightly, the squad responded with fire and neutralized the terrorist," police said in a statement, identifying the dead terrorist as a 20-year-old from Kafr 'Aqab, located to the north of Jerusalem. Reportedly the terrorist held a blue teudat zehut ID card, indicating permanent Israeli residency. Magen David Adom (MDA) teams provided medical treatment to the wounded at the site prior to evacuating them to Shaare Tzedek Hospital in the city.